Ametrine is a variety of quartz consisting of both amethyst and citrine with zones of both purple and yellow. Most naturally occurring ametrine comes from Bolivia, with some from India and Brazil. Differentially heat treating amethyst can result in ametrine and it can be produced synthetically in laboratories. 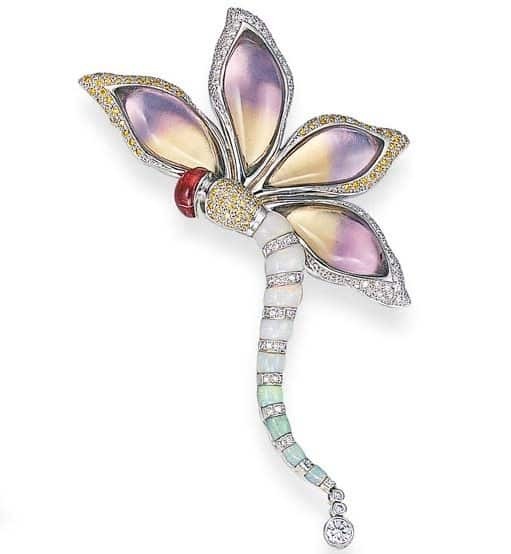 Ametrine Diamond and Opal Dragonfly Brooch. Photo Courtesy of Christie’s.